Our core strengths are the inlingua method and materials, which provide the quickest and most effective approach for all language learning objectives. The method is backed by a dedicated team of inlingua trainers and support staff, who further an enabling environment for successful language acquisition. During our classes, the main focus is the spoken language. The inlingua Method focuses on your oral skills rst, followed by improving your reading, listening and writing skills. You will learn the language by speaking it – all according to your personal needs. During the rst stage, your language teacher will introduce new topics and new vocabulary with examples and involve you in the learning process. Practice, practice and more practice: By using your newly gained knowledge, you will learn how to form correct sentences while gaining condence in your language and vocabulary skills – all with the help of your trainer. This is the moment when you can use the language in a creative way by acting out everyday situations, fun role play scenarios and interesting presentations – giving the language an exciting new meaning. Course books with exercises, audio course books, presentations on tablets and other language training material: Everything has been specially designed to support our unique inlingua training methods and created for various levels and language skills. With 50 years of experience, leading pedagogical experts from all over the world have been working on making the training material as great as it is today. If you want to benet from our exceptional language training material and learn meaningful vocabulary for everyday use or specialized needs, you will have to join the inlingua family as our material is not available on the open market. 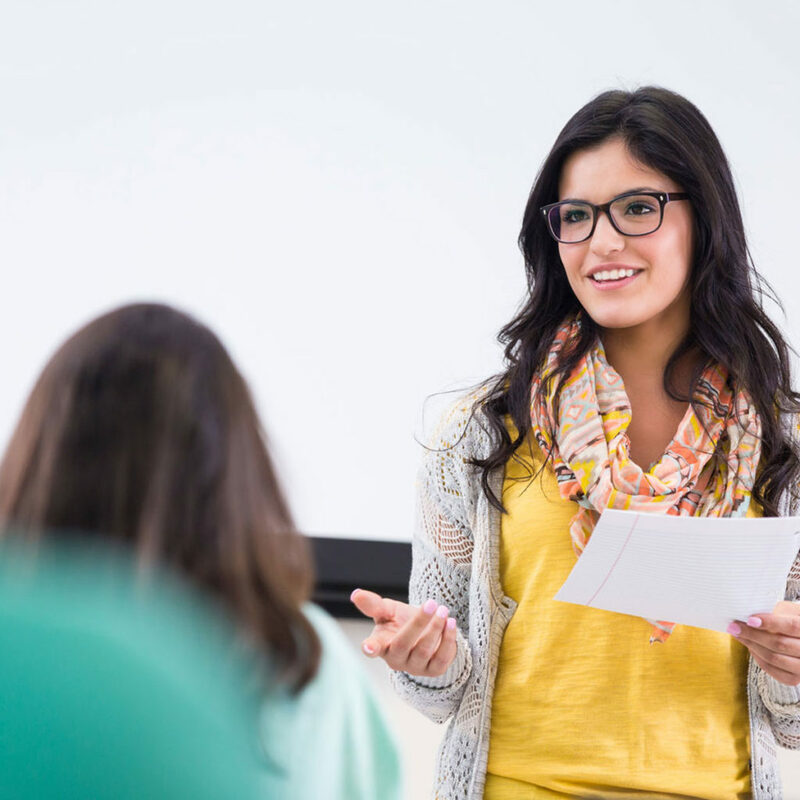 Better trainers make better students – this is why we work exclusively with qualied trainers who are native speakers with the ability to motivate others! Our trainers are trained through the inlingua Academy by inlingua experts in how to apply our training methods and use our specially designed material with individuals or small groups. Students work in a very relaxed yet productive atmosphere and are guided in the right direction by their trainer. Classes adapted to your needs: Your trainer will make sure that you keep up with the pace. Error correction: No whip, no cane – our teachers will correct your mistakes and pronunciation by using a positive approach. Step by step: We make sure that you master a topic before we move on to new ones. Your opinion matters: Feel free to express yourself during the course! Training techniques: Trainers use different techniques during their lessons in order to adapt to the variety of learning styles. One of our trainers shares her insights with you in the following video. Find out more about the inlingua Method in our short video.